At Thanksgiving we celebrate how the Pilgrims left England and came to America to start a new life. In class I often refer to my adult ESL students as “My Pilgrims” because they too left their homeland and came to America to start a new life. 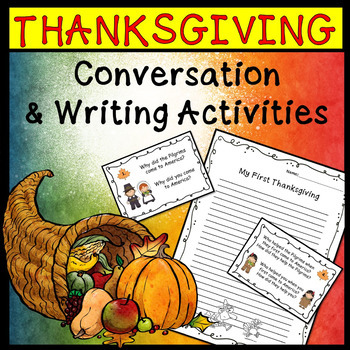 These conversation cards will help students learn about Thanksgiving. They will also allow your students to compare and contrast their experiences and their new lives in America with those of the Pilgrims and with those of the other students in class. Why did the Pilgrims come to America? Why did you come to America? How did the Pilgrims come to America? How long did their trip take? How did you come to America? How long did your trip take? 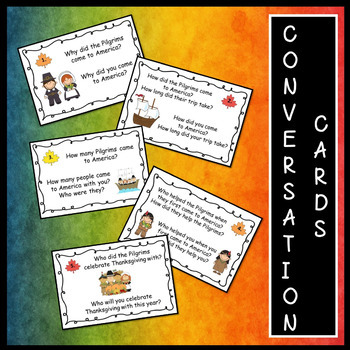 I hope these conversation cards will help your students engage in some meaningful conversations as they learn about Thanksgiving this year. Lesson Includes:Conversation Cards:Two sets (5” X 4” and 8” X 4”). 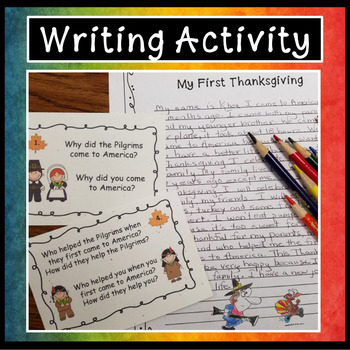 After engaging in conversation with their classmates, students should be encouraged to write about their first Thanksgiving in the United States. Directions are also included to help guide your students to write this assignment. 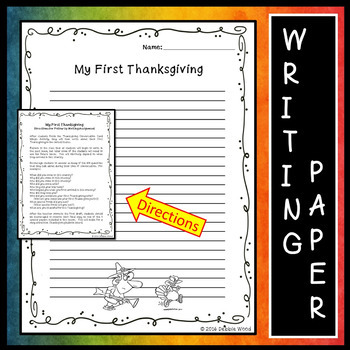 4 Decorated Writing Papers: Students will choose one paper to write their final draft. When students have finished writing, they can glue the story on a piece of construction paper. These will make a beautiful bulletin board display. This lesson is good for Intermediate to Advanced ESL students. This unit is developed to work well with the following Thanksgiving lesson.